It’s hard for New Yorkers to look hip in the cold but as humans hunker down we’ve been seeing a flurry of furry fashion. We hit the streets of the East Village to see who’s hot and who’s not on the cat–er–dogwalk. 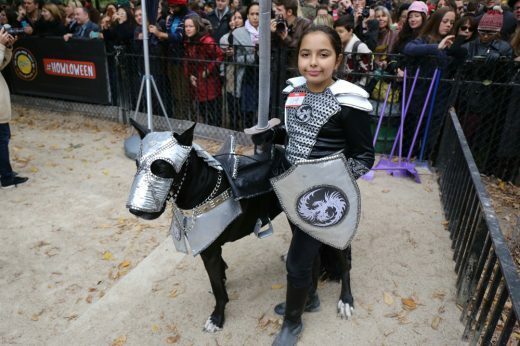 Saturday at Tompkins Square Park, the dog days of summer officially ended as canines of all sizes paraded around in the Halloween spirit. With hundreds of pups and twice as many people crowding into the park, no costume went unrepresented. This year, the contest’s top contenders included a caterpillar turning into a butterfly, Robin Williams as Teddy Roosevelt in Night at the Museum, and the obligatory “Barking Bad” duo. Watch our video to see a couple of honorable mentions — the Shake Shack and “The Greatest City in the World” — and many more doggies in disguise.